The 2nd line was able to do damage offensively, Scott Wilson scored his 4th goal in 5 games, and Marc-Andre Fleury stopped 27-of-28 shots on goal as the Pittsburgh Penguins were able to take care of business against the Winnipeg Jets, winning 4-1. While Evgeni Malkin wasn't able to register a point himself, Carl Hagelin potted a pair of goals and Kessel earned an assist on a great pass to setup Hagelin's second of the game. Kris Letang had the other goal for the Pens, scoring his 10th of the season to open up the scoring, and Derrick Pouliot posted his first career multi-point game with 2 assists. The win gives the Penguins a much needed 2 points, not only to keep pace with the Rangers and Islanders in the division but to put them further ahead of the Flyers and Devils, who started the day a point back of the Pens for the final wildcard spot in the East. In what's becoming a trend, it was an extremely slow start to the game for the Pens, but luckily Winnipeg wasn't able to threaten much themselves either. In his first game back since missing 10 with a lower body injury, Evgeni Malkin nearly got back on the scoresheet on his first shift of the game when he redirected a Phil Kessel centering pass just wide of the goal. The game would quickly turn into a back and forth neutral zone battle highlighted by some sloppy puck handling by both teams. After a long and mostly unmemorable stretch of hockey, the Penguins had a chance to get things going when Blake Wheeler put the puck in the stands from the Winnipeg defensive zone with just under 6 minutes remaining in the period. Unfortunately, having Malkin back on the ice wasn't a remedy for the power play's issues on this opportunity. After allowing early pressure from the Jets, the Pens were able to get another great opportunity off Malkin's stick as he took a pass from a scrum in the corner and was all alone in front, but he was unable to beat Michael Hutchinson glove side. Pittsburgh wasn't able to generate much offense on the power play otherwise, and Tom Kuhnhackl nearly scored on a bouncing puck situation behind the Jets' defense on the rush, but he was unable to finish and the game entered the first intermission scoreless. It didn't take long into the 2nd period for the Penguins to break through the sluggishness and open the scoring. 28 seconds into the period, Kris Letang took a pass from Patric Hornqvist and fired a shot that found the top corner on the far side. The Pens weren't done though, and 23 seconds after the goal they again found the back of the net when Carl Hagelin redirected an Ian Cole slapshot from the blueline past Hutchinson to increase the Pittsburgh lead to two. The Pens almost made it three just over a minute later as Kuhnhackl had a golden opportunity in front off a rebound, but he wasn't able to elevate the puck and Hutchinson was able to get enough on it to prevent the goal. It was a big wakeup call for the Penguins, but the Jets were able to get themselves going as well as the period progressed. Midway through the period, the puck came to Sidney Crosby down low with a wide open net, but a diving Hutchinson was able to get the blade of his stick on the puck and redirect it away. Moments later, it was Marc-Andre Fleury's turn to break up a great scoring chance with his stick, as a diving pokecheck knocked the puck away Nikolaj Ehlers as he skated in alone on a breakaway. The Jets would get on the board shortly thereafter on the power play. Evgeni Malkin was sent to the box for an offensive zone trip, and the Jets wasted no time. Dustin Byfuglien ripped a shot from the blueline that Blake Wheeler was able to redirect past Fleury to cut the lead to 2-1. The Jets would again find the back of the net with 4 minutes left in the 2nd after a mad scramble in front, but the referee behind the net lost track of the puck and was in the process of blowing the play dead when Jacob Troub took the loose puck and fired it behind Fleury. The play was reviewed, but the original call of no goal on the ice was upheld. A Dumoulin high-sticking penalty with 16.7 seconds left in the 2nd gave the Jets an opportunity to pull even coming out of the intermission. Mathieu Perreault had a chance in alone on Fleury that likely would have been challenged for offsides if the puck went in, but Fleury was able to turn the shot aside. The Pens would take advantage of the kill and extend the lead a little over 5 minutes into the 3rd period. Derrick Pouliot wristed a shot from the blueline that Scott Wilson was able to get a stick on between the circles. The redirection bounced off the ice and over Hutchinson's outstretched right pad in the butterfly to give Wilson his 4th goal in the past 5 games. Despite increased pressure from the Jets, the Pens were able to increase the lead midway through the period on Hagelin's 2nd goal of the game. Phil Kessel found a wide open Hagelin on the far post, and Hagelin one-timed a shot that initially was stopped by Hutchinson's stick before the goaltender's momentum took the puck into the net. It was enough to put the game out of reach, as the Jets weren't able to muster much in the way of chances for the remainder of the game. 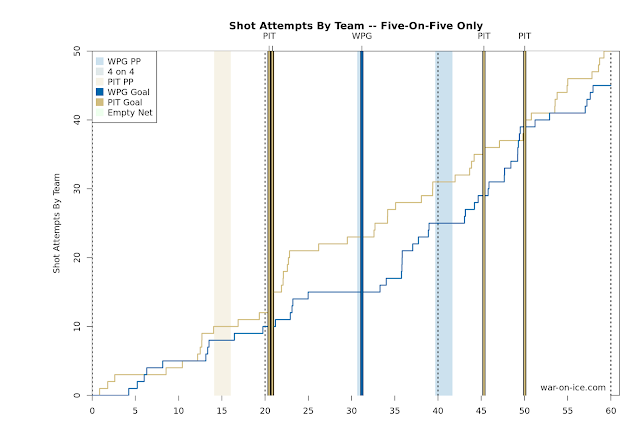 It was a slow start to the game with not many attempts at either end of the ice, but the gameplay started opening up in the 2nd period and the Penguins were able to finish the game with a comfortable advantage in possession, having posted a score-adjusted 55.9 CF%. After taking on the new Jets, the Pens will take on the old Jets as the Arizona Coyotes come to down. It'll be another good opportunity for the Penguins to take away two points, and they'll need to bank the points as they face a difficult week that sees them take on the Capitals and Rangers in their following two games.